Chloe Wills looks back to see if the pitch was called a strike or ball by the umpire. Amber Niles on the mound for the Lady Saints in the game against Ashville. The Ashville Lady Bulldogs opened the season with three straight wins, a doubleheader win over Jacksonville and a victory over the St. Clair County Lady Saints. Ashville scored six runs in the bottom of the second inning and six more runs in the fifth inning, and went on to beat Jacksonville 14-4. The Lady Bulldogs pounded out 16 hits. Winning pitcher Sydney Chamness went the distance, giving up four runs on four hits, walked four and struck out seven over five innings. The big blow in the second inning was a bases-clearing triple by Chamness, who finished the game 2-for-4 with 4 RBIs. Ashville added two runs in the third inning on a single by Chloe Wills and a triple by Ashlee Eastis. Eastis and Jennifer Turner had 3 hits each for Ashville. Eastis drove in 3 runs, while Turner had 2. Erica McCay also drove in 2 runs on 1 hit. Chloe Wills, Tori Layfield and Lexi Copeland all had 1 RBI each. Ashville beat Jacksonville in the nightcap by the same score, 14-4. The Lady Bulldogs belted 18 hits and scored in every inning, starting with four runs in the first inning on three singles and a double. Jada Wills picked up the win as she worked five innings and gave up 3 hits, walked 1 and struck out 2. Ashville made it 7-1 in the bottom of the second inning as Chamness hit a two-run homer and a Copeland single scored Layfield. Chamness drove in two more runs in the third inning with a double, while Copeland single scored Chamness and Layfield. A two-run homer by Eastis in the fourth inning made it 13-4 and Juli Mostillo’s single in the fifth inning scored Layfield to end the game at 14-4. Ashville pounded out 14 hits in the 8-5 win over SCCHS. Jada Wills picked up the win for Ashville as she worked three innings in relief and gave up two hits and walked one. Amber Niles took the loss for St. Clair working six innings and striking out six. The Lady Saints took a 1-0 lead in the first inning as Chloe Henderson scored on a pass ball. Ashville scored two runs in the third inning as Rachel St. John scored on a pass ball and Lexi Copeland singled to score Tori Layfield. The Lady Saints regained the lead in the fourth inning with three runs. Brooklyn Sertell had a two-run double followed by a run-scoring single by Kylee Frazier. Ashville tied the game in the bottom of the fourth inning on RBI doubles by Eastis and Chamness. The Lady Bulldogs took the lead for good in the bottom of the fifth inning as McCay scored on an error to make it 5-4. Ashville finished off the game with three runs in the sixth inning as Layfield scored on a bases-loaded walk. Thomason had a sacrifice bunt that scored Turner and a single by Chloe Wills scored Mostillo. In the top of the seventh inning, Niles scores on a groundout by Kaydence Byers, making the final score 8-5. 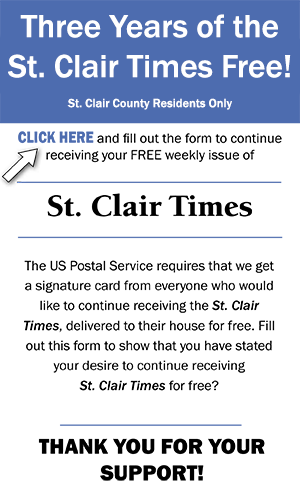 Reach Gary Hanner at ghanner@thestclairtimes.com.